A black woman already with three children has been stunned after giving birth to a white baby girl who has red hair and blue eyes. Patience Chando, a black mother-of-three was totally baffled after she gave birth to a white, red-haired child with blue eyes. According to The Sun UK, the mother and her partner Andreas Spillea thought their daughter’s pale complexion would darken in the days after her birth – but the youngster is continuing to turn heads. Patience said: “I couldn’t believe it. Her skin was too white when she was born, I was sure it would tone down, which happens sometimes, but it hasn’t. “It wasn’t until a few days after she was born I started to think: ‘hold on, her skin was white. I’m her biological mother and I’m black’. 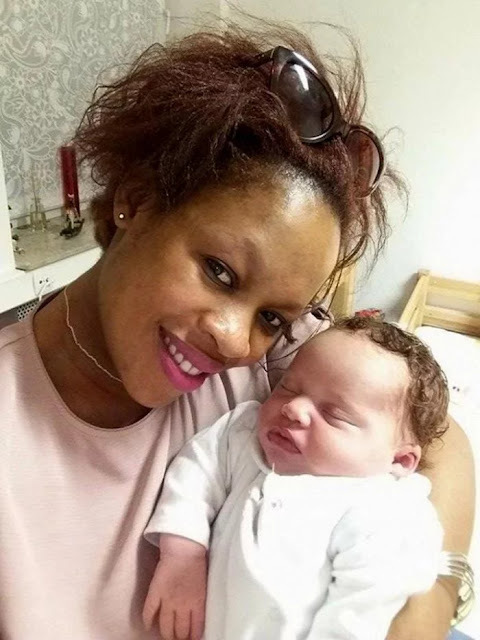 When four-month-old Andrea Mariella was born in Hanover, Germany in April former office worker Patience was stunned. Doctors were equally amazed and carried out checks to ensure Andrea didn’t have a skin disorder. Patience, who has two older daughters 15-year-old Faith and 17-year-old Lucricia, moved to Hanover after meeting her new partner, 49-year-old German Andreas, in Zimbabwe. Patience said that she has traced her ancestry but found no white heritage in her family, despite experts saying this could be behind her daughter’s creamy complexion. Dr. Bryce Mendelsohn, a medical geneticist at the University of California, said: “People of African descent have traces of European in their ancestry, especially from populations with many geographic origins, so that could be the case here. “The child is distinctly lighter than her mother, but of course there is another parent to consider. Children often resemble one parent more than the other.